In 1884, Henry Royce entered a partnership with a friend of his and began a business manufacturing electric fittings. After several iterations, the company became Royce Ltd. in 1899. Ever the entrepreneur, however, Royce realized that the business in electric manufacturing had become too competitive and that a different product was needed to keep his company viable. Royce had always been fascinated by mechanical things, so he settled on the motor car as a potential new avenue for his business. By 1902, Royce had bought two different cars and found them wanting. After deciding to build his own car, Royce spent the next two years experimenting and building. By 1904 he had built three cars. One of those was sold to a director of the company, a man named Henry Edmunds. Edmunds was friends with Charles Rolls, a businessman who ran a car showroom in London selling imports. Edmunds showed the Royce-built car to Rolls and subsequently arranged for the two to meet, a meeting that occurred in May 1904. After raising £100,000 of capital by selling public shares in the new company, Royce began development of an all-new model. After the company moved to a new factory in Derby, all focus was placed on producing and marketing the six-cylinder Rolls-Royce 40/50 Silver Ghost. Thanks to Royce’s exacting standards, the Silver Ghost quickly established the reputation of Rolls-Royce Limited as a top-class automobile manufacturer. 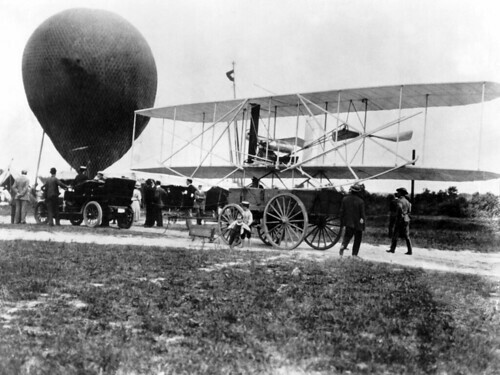 The Wright brothers are granted a patent for their “Flying-Machine”. During their experiments of 1902 the Wrights succeeded in controlling their glider in all three axes of flight: pitch, roll and yaw. Their breakthrough discovery was the simultaneous use of roll control with wing-warping and yaw control with a rear rudder. A forward elevator controlled pitch. In March 1903 they applied for a patent on their method of control. The application, which they wrote themselves, was rejected. 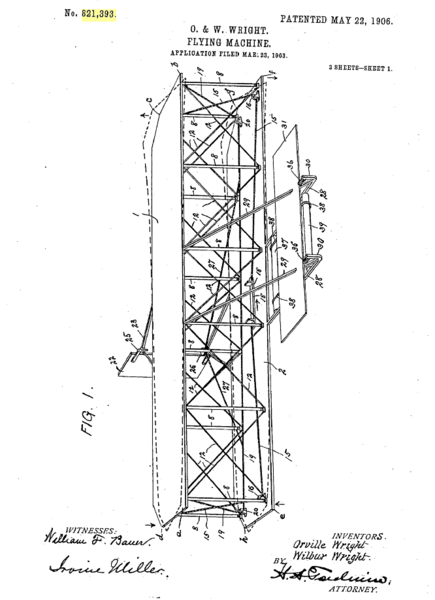 In early 1904, they hired Ohio patent attorney Henry Toulmin, and on May 22, 1906, they were granted U.S. Patent 821393 for a “Flying Machine”. The patent’s importance lies in its claim of a new and useful method of controlling a flying machine, powered or not. The technique of wing-warping is described, but the patent explicitly states that other methods instead of wing-warping could be used for adjusting the outer portions of a machine’s wings to different angles on the right and left sides to achieve lateral control. The concept of lateral control was basic to all aircraft designs; without it they could not be easily or safely controlled in flight. The broad protection intended by this patent succeeded when the Wrights won patent infringement lawsuits against Glenn Curtiss and other early aviators who devised ailerons to emulate lateral control described in the patent and demonstrated by the Wrights in their 1908 public flights. U.S. courts decided that ailerons were also covered by the patent. The first flight of a fixed wing aircraft in Europe takes place. In 1906, the Brazilian Alberto Santos-Dumont made public flights in France with his 14-bis. A canard pusher biplane with pronounced wing dihedral, it had a Hargrave-style box-cell wing with a forward-mounted “boxkite” assembly which was movable to act as both elevator and rudder. He later added auxiliary surfaces between the wings as primitive ailerons to provide lateral control. His flight was the first made by a powered heavier-than-air machine to be verified by the Aéro-Club de France, and won the Deutsch-Archdeacon Prize for the first officially observed flight of more than 25 metres. It later set the first world record recognized by the Federation Aeronautique Internationale by flying 220 metres in 21.5 seconds. The next year Louis Blériot flew the Blériot VII, a tractor monoplane with full three-axis control using the horizontal tail surfaces as combined elevators and ailerons. Its immediate descendant, the Blériot VIII, was the very first airframe to bring together the recognizable elements of the modern aircraft flight control system in April 1908. Where Horatio Phillips and Traian Vuia had failed, Blériot’s was the first practical tractor monoplane and marked the start of a trend in French aviation. By 1909, he had developed this configuration to the point where the Blériot XI was able to cross the English Channel, among other refinements using the tail surfaces only as elevators and using wing warping for lateral control. Another design that appeared in 1907 was the Voisin biplane. This lacked any provision for lateral control, and could only make shallow turns using only rudder control, but was flown with increasing success during the year by Henri Farman, and on 13 January 1908 he won the 50,000 francs Deutsch de la Meurthe-Archdeacon Grand Prix de l’Aviation for being the first aviator to complete an officially observed 1 kilometre closed circuit flight, including taking off and landing under the aircraft’s own power. The first ever Grand Prix motor racing event held. The very first Grand Prix took place on June 26 and 27, 1906. The venue was public roads in the vicinity of Le Mans, France near the Sarthe River, so it became known as the Sarthe Circuit. Previously, the only series that could be called international was the Gordon Bennett, established by James Gordon Bennett, Jr., owner of the New York Herald. . Entrants came from a number of European countries that had national teams. Each country could enter only three cars and they had to be made in that country. There were no mechanical or physical limitations placed on the cars. Course map of the first Grand PrixThis first Grand Prix was organized by the Automobile Club of France (ACF) at the urging of French automakers. The city fathers of Le Mans and local hotels provided the necessary funding and persuaded the ACF to hold the race near the city. The course was laid out by the Automobile Club de la Sarthe over 64.11 miles of local roads. The route was roughly triangular with each leg approximately 20 miles long. Sharp corners were at the apexes of the triangle. 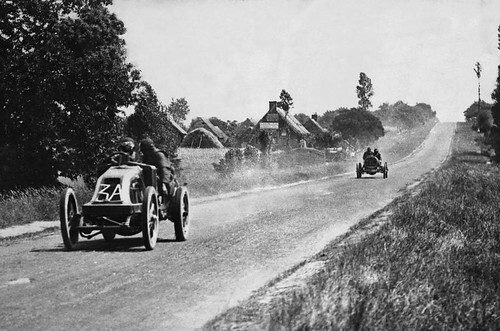 The first French Grand Prix motor racing event is held. 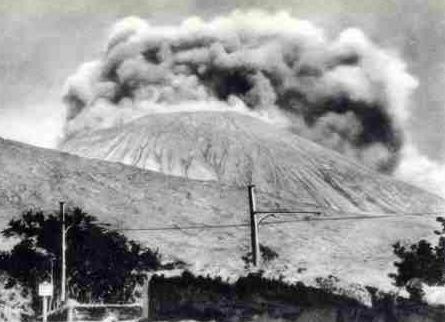 An earthquake followed by a fire destroy most of San Francisco, California. The 1906 Summer Olympics open in Athens.